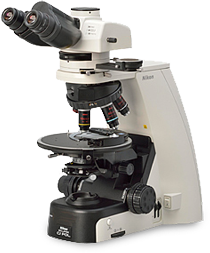 Compact polarizing microscope featuring superb optical performance and ease-of-use. Slim and compact, the Eclipse Ci-POL is a polarizing microscope that doesn’t occupy your entire desk. With cutting-edge CFI60 infinity optics, it offers advanced optical performance and user-friendly operation. Built-in capture button located near the front of the microscope base allows easy imaging with DS series cameras. The nosepiece uses the same DIN standard compensator slot design as Nikon’sLV100N POL to accept various compensators for advanced quantitative measurements. All five objectives are centerable. The Eclipse Ci-POL utilizes Nikon’s CFI60 optical system, which successfully deliver long working distances and high NA and produce tack-sharp aberration-free images. They employ an eco-glass that is manufactured with no harmful substances such as lead and arsenic. The episcopic objectives are from the newly developed CFI60-2 series and produce pin-sharp aberration-free images regardless of magnification.